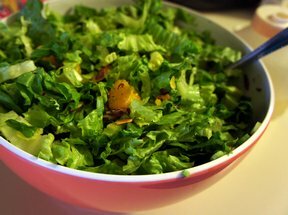 Prepare and combine first 5 ingredients. In non-stick pan, heat 2 T. sugar to slightly brown, toss slivered almonds onto caramelizing sugar and keep tossing til brown. Set aside on buttered or Pam-sprayed surface to cool. Keep separate for garnish at time of serving. 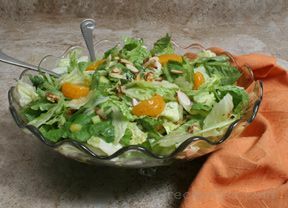 Prepare dressing and toss into salad at time of serving, garnish with caramelized almonds. 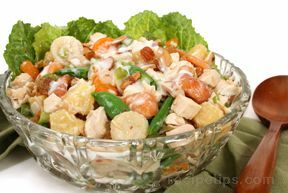 A good idea to keep all three parts separate until time to serve so that ingredients stay crisp and caramelized almonds (such a treat) don't get soggy from the dressing. Great with stir-fry main dishes.